The new Toyota Corolla sedan will officially debut this week, as confirmed by Toyota. The North American specification 12th-generation car will be revealed on Thursday, November 15, and around the same time, the Corolla and its Levin sibling will be shown for the Chinese market on November 16. That's right, the Levin name, best remembered from older Corolla performance models, still lives on in some markets. 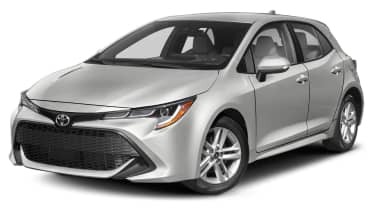 As Toyota already unveiled the Corolla Hatchback version earlier this year, the looks of the sedan will probably not come as a big surprise; even so, Toyota has elected to tease the front end of the four-door car with this mostly dark shot. The basic lines of the front end are there to be seen, with slightly different LED lighting, and the design of the rest of the car is likely to follow suit: a slightly less sporty version of the hatchback, complete with a trunk, based off the same global TNGA platform that underpins some future Toyota products. The car's chassis and handling are likely to be tuned toward more conservative sedan buyers, as the somewhat-Scion hatchback and the European market Touring Sports wagon have been touted more as drivers' cars, targeted towards buyers of sporty Civics and Golfs. For instance, it will be interesting to see how much the sedan's rear axle will differ from the multi-link one in the hatchback, and what kind of engine palette will be on offer: The hatch comes with a two-liter, 168-horsepower Dual VVT-I engine only.